In the last four weeks, I have covered many different ways to care for or maintain your system. Many items have been ways to be mindful on a day-to-day basis (water usage, care when flushing, and lateral maintenance). However, one of the most important things you can do for your system is pump it regularly. 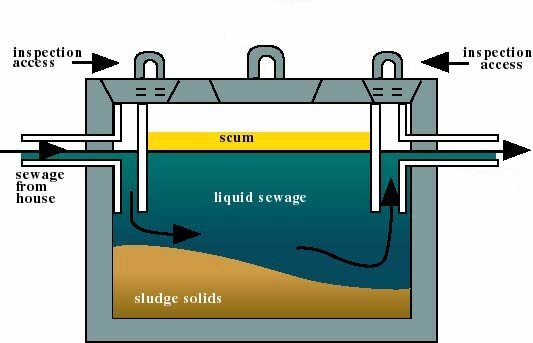 The diagram above shows what an average septic tank contains on a daily basis. You will see sewage or wastewater comes in from the house, then liquid, sludge and scum get trapped in the tank, and finally wastewater that seeps to the laterals field. Though you may find all these components completely gross, it’s actually important that each are there in their respective amounts. However, what’s most important is to regularly pump it out. Just like you change the oil on your car to get the bad stuff out, your septic system needs the same type of care. If the solids that collect at the bottom of the tank aren’t cleaned out from time to time, they can build up and seep out to the lateral field. You do not want this for your system. If you can think of your lateral field as being a sponge, the solids that seep out to the “sponge” can clog it up and reduce the life of your system. It is recommended that your tank be pumped every 3 – 5 years based on activity level. Therefore, the more people who live in your home, the more frequently you need to have it pumped. Families of four or more need to be on the 3 year side (maybe even 2 year if you entertain a lot). If it is just you and your spouse, you could probably go every 5 years. The main key is to remember it and make sure you do it regularly.